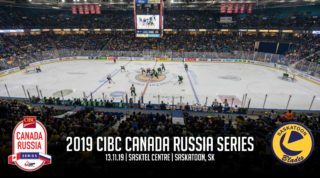 The win streak hit six games on Saturday night and the Saskatoon Blades remain undefeated in the month of March after bucking the Swift Current Broncos 6-1 at SaskTel Centre. 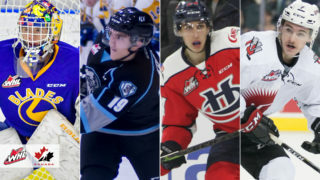 The Blades now sit at 94 points with a 43-14-8-0 record with three games remaining in the regular season. The first goal didn’t come until 6:43 into the second period but then the flood gates opened. Tristen Robins tucked in his 9th of the season on the power play to start things off. 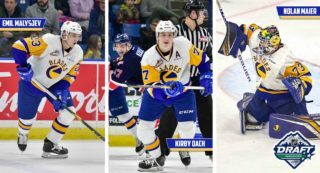 Eric Florchuk and Max Gerlach assisted. 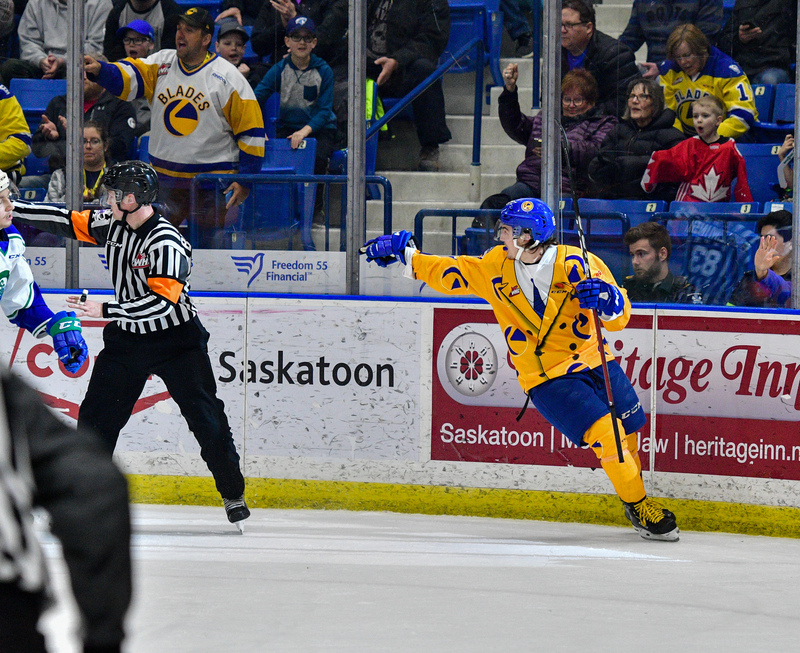 Less than a minute later Kristian Roykas-Marthinsen (12) tipped a point shot from Reece Harsch; Eric Florchuk had the secondary assist for his second of the night. 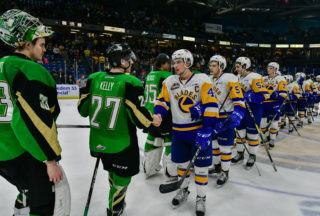 In the final minute of the middle frame Riley McKay delivered a gift to Ryan Hughes on a 2-on-1 rush and Hughes one-timed his 28th of the season past a sprawling Riley Lamb; Aidan De La Gorgendiere had the extra helper and Saskatoon took the 3-0 lead into the break with a 29-11 advantage on the shot clock. 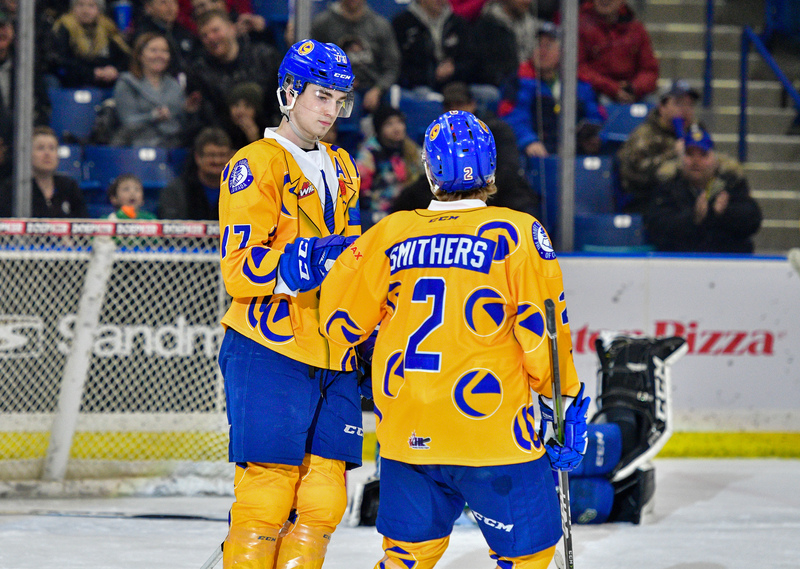 Ryan Hughes was at it again in the third period taking only seven seconds to find the back of the net for his 2nd of the game and 29th of the year. Kirby Dach had the assist, thanks to the opening face-off win. Eric Florchuk continued dealing as he set up Dawson Davidson in the slot to make it 5-0 for the home side. The goal was Davidson’s 12th of the season and second in as many games. Rookie Kyle Crnkovic had the secondary assist. Swift Current did manage to light the lamp after a deflected shot fooled Dorrin Luding; Matthew Culling got credit for his 11th. 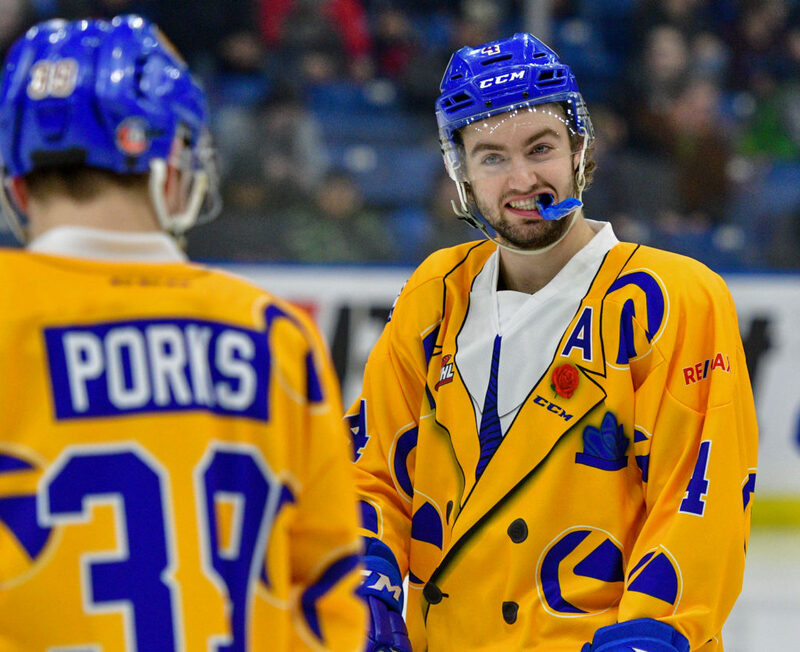 Kirby Dach put the finishing touches on the victory with some flashy moves to match the flashy Don Cherry style jerseys. Dach’s 25th of the season came with just 2:20 left on the clock, Kristian Roykas-Marthinsen picked up the lone assist on the play. Chase Wouters went 14/17 in the face-off circle. 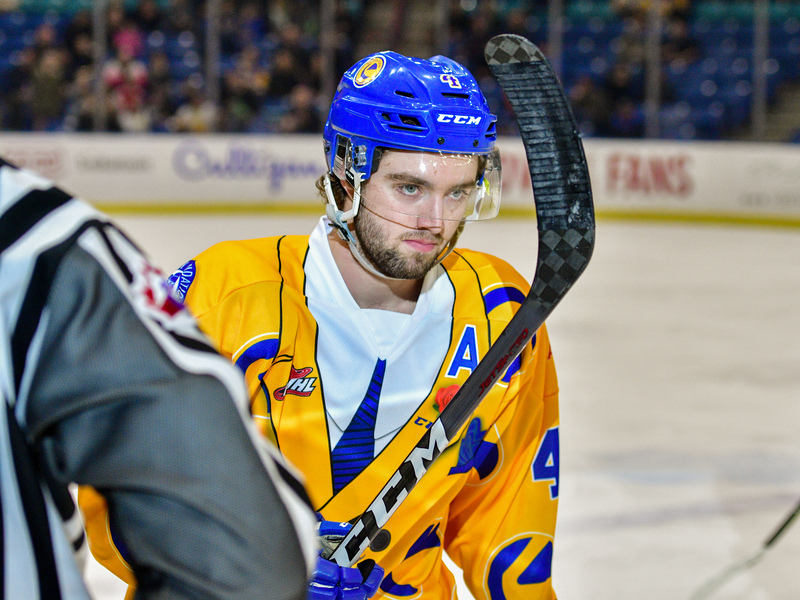 Kirby Dach recorded his 21st multi-point game of the season. Riley McKay has surpassed twice as many points as his previous career high from last season, and now has 6 points in his last 6 games. Eric Florchuk hit the 50 point mark, tying his career high from last season. 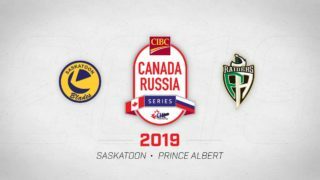 The Blades host the Moose Jaw Warriors tomorrow (Sunday) afternoon at 4:00pm in a preview of the 2019 first round playoff matchup.